Grammy winning Bluegrass musician Steve Martin is also an actor and a one-time stadium-filling stand up. 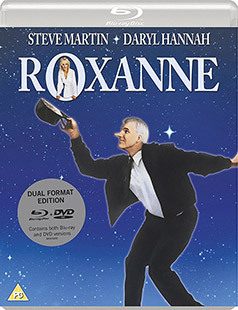 His greatest screen accomplishment IMHO is an adaptation of Edmond Rostand's Cyrano de Bergerac, ROXANNE. Camus is re-smitten by the Eureka Blu-ray. "Well, I do a lot of character stories. I don't shoot dialogue the way most people shoot dialogue; you know, the medium shot, wide shot, close-up, close-up, reverse shot. Filmmakers lose their bravura when they get to dialogue scenes. I like to do things that people don't notice you're doing, bringing things into the background. I shoot dialogue as action, or probably a better description, I shoot it as emotion." Role models come in all shapes and sizes, all colours and sexes and exhibit many virtues and flaws. A small town fire chief with an abnormally sized nose, a short fuse and a romantic streak a mile wide may seem like an odd character to look up to but in my mid-20s, Steve Martin as C.D. Bales (Cyrano D. B., get it?) represented a fairly close example of the kind of humanity I most admired. He wasn't handsome per se but he was playful, effeminate almost but incredibly tough. He also fell hard when it came to matters of the heart. He was good at his job in an almost preternatural way despite being saddled with the world's worst fire fighting team and his physical mannerisms were almost (but on the right side of) affected. He'd pluck darts from a dartboard in a mannered curl of his hand and choose pens from a jar in the same way, both of which I saw as very feminine movements. He knew how to cook, he dressed practically, (white socks, maybe not so great but very American) wore classic black Reeboks (feet-loving trainers in the 80s, the best and most comfortable footwear I've ever worn, commercial over) and more than any other trait, he knew the power of words and how to craft them. Roxanne is a movie that celebrates the written word while swathed in a slapstick, rom-com gown. Steve Martin has always used his innate physicality as a vehicle for comedy. In The Man With Two Brains and All of Me, it's the loss of control that proved the comic draw. In fact, I can't remember seeing a funnier start to a film than the Martin and Kathleen Turner scenes intercut at the start of the former movie. It's very patchy, but Brains has some inspired comedy ("Into the mud, scum queen!") and in All of Me, Martin manages a charming romance between the left and right sides of his own body, a warm up feel-good movie rehearsal for Roxanne. C.D. (Charlie) Bales is a fire chief of the small town of Nelson, a ski resort in Washington State (in reality, British Columbia, in Canada). Cursed with a very long nose, he dishes out his own brand of violence to anyone making fun of it. Two new arrivals to the town set the romantic wheels in motion. The dim new fireman, Chris (Rick Rossovich) is a handsome, buffed gym junkie who's not even found any cylinders yet, let alone firing on any. Roxanne Kowalski (Daryl Hannah in her bloom) is an astronomy student hoping to spot a comet she's theoretically discovered. Socially, these two lock eyes and fall for each other but there's a small problem. Chris is a klutz and without a clear, cast-iron invitation, he's scared to go near Roxanne. His wit needs constant defibrillation. He says "What am I afraid of her for? She's no rocket scientist!" Martin deadpans "Actually she is a rocket scientist..." So despite the fact that Martin - in helping Hannah get back into her locked house - is slowly falling in love with her himself, he agrees to help fan the flames for the two new arrivals. And how is this achieved? Letters. Remember letters? C.D. can now express his smitten soul to the woman he loves while Chris takes all the con's concomitant benefits. Meanwhile, C.D. tries to keep his fire fighting force focussed while watching as his words wrap themselves around his love while he stays platonically admired on the side-lines. Boy, have I been there, a unique, exquisite torture. The supporting cast is a treat and the many smaller supporting roles are represented with few scenes but the writing is so light, tight and memorable that almost everyone is quietly impressive to one degree or another and no, I don't know what that 'degree' cliché means either. There's Chuck (John Kapelos), the sleazy and lascivious owner of a fur shop titled 'All Things Dead'. "That's very you..." The mayor, (Fred Willard) is trying vainly to get the townsfolk interested in his beer festival via a cow, "Teach Flossie to drink a beer!" C.D. 's best friend, Dixie (Shelley Duvall) is there for him in times of woe and one of the smallest but telling moments belongs to her and in its own way it's quite shocking. C.D. is at his lowest ebb and Dixie has given the game away to Roxanne. We know how C.D. deals with people who do him wrong (quite violently actually) and as he puts his arm up, Dixie flinches. It's a sobering moment as Martin gently places his hand on her head and then holds her hand. The fire fighters are an eclectic bunch. Most memorable is the inimitable Michael J. Pollard as Andy, he of first season Star Trek and Bonnie and Clyde fame. On the surface he's slow and a little odd (good casting for the odd part) but he gets his friends to buy intellectual books for him because he's embarrassed. In a polished piece of double-duty screenwriting, this little comic bit of business convinces Roxanne that Chris does have a brain as he's the one who picks up Sartre's Being and Nothingness for Andy. Nothing says intellectual curiosity better than being a Sartre reader. Brian George pays the plastic surgeon to whom C.D. goes with a bottle of vodka in place of the anaesthetic he's allergic to. "This time I want you to do it, Dave. I want you to cut that thing off!" George is on screen for just a few minutes but he makes a lovely impression, sympathetic and warm. The film has a bright and breezy look to it, shot with some careful sensitivity to the picture postcard locale by Ian Baker. In some ways the town of Nelson is just too good to be true. It's always colourful and stuffed to the gills with little details that the Blu-ray is making available after its standard definition, fuzzy life on VHS and less fuzzy DVD. This comedy has been shot in the anamorphic 2.40:1 aspect ratio (see Sound and Vision), and on pan and scan VHS or broadcast, Roxanne looked an almighty mess. Can you imagine the audacity of the telecine operator essentially re-editing the movie given two 4:3 sides to choose from cutting from left to right and back again or whiz-panning from left to right. Aieee. Comedy suffers from this practise more than any other genre. A great deal of the comedy and therefore the timing is created by the framing of the shots. Director Fred Schepisi has a real knack for knowing exactly where to put his camera for maximum effect and it's an added delight to concentrate on other parts of the wide anamorphic frame to see what detail - even after about fifteen viewings – I may have missed. Camera movements are kept to a minimum except for following actors. Roxanne is mostly a carefully framed collection of locked off shots and as such, the movie allows the actors to control the narrative rather than any flashy directorial tics. In fact, the movie slips by briskly and you are never reminded that there is a director – that's praise, trust me. Making something look as invisible or natural as this being in the eye of the production storm and the quiet chaos of the cutting room is a rare talent. There is not a dud or redundant scene in the entire picture. Small scenes included for comic effect suddenly take on emotional heft. After the stand alone bar scene of C.D. humiliating a bully by thinking up many different ways to make fun of his nose, there's a scene of Roxanne asking C.D. to push Chris in her direction. C.D. is crushed thinking he was the target of her affection. He agrees to help but Martin is superb in this scene, turning bashful love and longing into dashed hope and a reluctant involvement in a love affair he thought he was destined to enjoy. Roxanne says about the previous night's events "It's the first time I've seen anyone actually be brave." Heartbroken, C.D. says "Oh, I've been a lot braver since then..." The truth of it flies over Roxanne's head but this is why Martin is such an accomplished writer. The smart lines, the comic touches are anchored by an emotional power that makes the drama all that more poignant. But let's not forget the 'com' of the rom-com contraction. Set to a delightful pair of Mozart Divertimentos, there are two stand out scenes that occur three quarters of the way through the running time. Roxanne is away and C.D. takes the opportunity to write her letter after letter. He's trying to keep it low key and each letter-posting shot has Martin deliver another bit of comic business. It's charming but this is just paving the way for the movie's most inventive comedy scene. Alarmed that Roxanne has come back early, Chris has to be made aware of these letters, "...twenty or so." C.D. (who has already shown us how physically dexterous he is in an earlier scene) rings the doorbell of Roxanne's house and shimmies up the house from the outside to speak to Chris privately. The stunt work here is first class. Let's just say things don't exactly go to plan but as a sustained comedy scene as physically lively as any I've seen, this is a pure joy. The Mozart pieces feel like they were written bespoke. In fact, I'm going to watch them again right now. Pause... Marvellous. If forced to carp, there are three aspects (and a fourth trivial one) of the film one could take issue with, one of which may have dated it and two of which you have to professionally suspend your disbelief to get past. Firstly, the Bruce Smeaton saxophone driven score nails the movie to the 80s. There's nothing wrong with it and though emotionally pitched correctly and perfectly in keeping with the style and flow of the movie, it crops up once or twice more often than needed. The other two aspects I mentioned are both to do with the romantic triangle. Firstly, if a man is paralysed with fear at the prospect of meeting a woman he's attracted to (there's a contradictory conundrum to start with) so much so that he will climb out of bathroom windows to avoid her, then where does that confidence spring from that has him bounding into her arms as soon as she makes herself available to him? On the same subject, Roxanne would have to be several shades of stupid not to realise that there are two men speaking to her from her front garden. Actors Rossovich and Martin couldn't be more different. Oh, and lastly, every credit and title in the movie is neon pink matching Dixie's Café's signage. That sets up the mood and tone of the piece right there, doesn't it? But hey, get past those nit-picks and there's a great deal of joy to be had. Roxanne is to Martin's career as Annie Hall is to Woody Allen's and it's a triumph of physical comedy, engaging characters and a charming central romance played by a cast at the top of its game. For me at least, that's irresistible. Roxanne is presented in the 2.40:1 aspect ratio which is a small increase on the usual 2.35:1 anamorphic aspect ratio. Research tells me that after 1970, the scope ratio was closer to 2.39:1 but convention kept the 2.35. To make the neatest HD version of a Panavision print the 1920 width partners an 800 height, making it exactly 2.40:1. Domestically the wider the screen, the smaller the image (being crammed into a 16x9 TV area). Being mostly set in sunny daylight or brightly lit interiors, the film looks terrific and has been given a real boost over previous DVD releases by virtue of the excellent quality of the HD transfer on Eureka's new Blu-ray. The contrast balance and colour rendition are both spot-on and do not lose their integrity when the light levels drop, and the sharpness and level of detail is up there with some of the best recent big studio releases. As you would expect, there's no trace of dust or damage or any trace of picture instability. The original Linear PCM 2.0 stereo mix is pleasing with no audio distractions, but obviously the sub and rears have not much to do. There's also a DTS-HD Master Audio 5.1 remix, which while making only subtle use of the rear speakers for music location sound, has a noticeably richer feel overall, with even the dialogue sounding like it's been re-recorded especially for the this mix. Optional English subtitles for the deaf and hearing impaired are also available. The paucity of extras does let this dual format release down just a tad. And the one we've got can be sourced on You Tube in a few clicks so exclusive content certainly doesn't apply here. It's a real shame because the lightness of touch a movie like Roxanne displays is rarely championed in behind the scenes documentaries. It's so hard to do 'light' in movies and not run risk of being inconsequential. I would have paid extra for a Martin or Schepisi commentary but alas. Enjoy the trailer but wish for so much more. A romantic ideal (the imperfect guy gets the girl) that I couldn’t resist as a young man and still have a respectful fondness for, Roxanne is an undemanding one hundred minutes that manages to entertain fluidly for all of its running time and from this old bleeding heart, it still gets an enthusiastic and happy thumbs up.